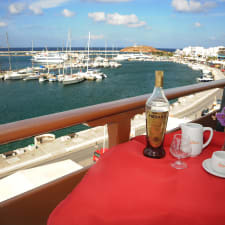 The 2-star Hotel Coronis is situated at the most convenient place in Naxos Town, at seafront and it offers superior view to both the Venetian Castle and the sea. The hotel has been renovated offering its guests modern facilities and is open all the year round. In addition the friendly and hospitable atmosphere makes your stay unforgettable. Hotel facilities and services include bar; free Wi-Fi ADSL Internet access; lounge with satellite TV; buffet breakfast; breakfast room; 24-hour reception; elevator; safe; fax; currency exchange.